Ingersley Vale and its mills have a long and illustrious history. There were once three mills in the vale, a waulk mill (wool processing), Ingersley Vale, often known as Clough mill, and Rainow mill, lost to a fire in 1908 and with J. McNulty’s glass works on the site for many years, and now a joinery workshop. Ingersley Vale or Clough mill has been altered many times over the centuries. The remaining structure carries a date stone of 1809 (right). 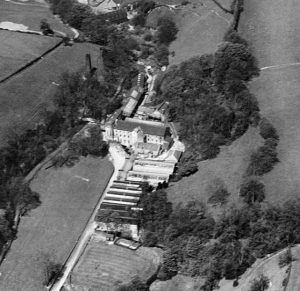 When originally built by Edward Collier in 1792/93 as a cotton spinning mill there was a row of cottages and the mill manager’s house located along the valley floor upstream of the mill. 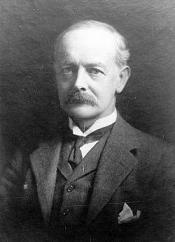 George Longden, the well informed local historian, established that there was an apprentice house on the site, as there still is at Styal, though he could not identify its location within the complex. Edward Collier developed the mill and his date stone shows 1809 indicating a re-building. He became bankrupt in 1811 and the mill was sold to the adjacent landowner, Thomas Gaskell. It was tenanted to Chadwick, Clegg & Co. of Manchester; in 1826 J & J Fearnley plus Martin Swindells I went into partnership here, but was dissolved in 1830, all cotton spinning. In 1844 the tenants were John Leigh and others. In 1850 it was occupied by John Brice and Co., calico printers and in 1874 Anthony Scott and Co. dyers and yarn polishers. Later it was extended to four times it`s original size and occupied by A.J.King and Co Bleachers between 1878 and 1929. The original mill was accompanied by an apprentice house, one of only four in Cheshire – you can visit the restored apprentice house at Styal village. The mill was again rebuilt after a fire in 1819. Also in the 19th century the cottages and house were removed and additional mill buildings erected over the river upstream of the main mill. In the 20th century these were altered and extended. The mill is located at the narrowest point in the valley. All these mills were located in the river Dean valley because of the availability of water to drive their water wheels and mill machinery. Ingersley mill was water powered until the 1950s. In 1803 the power of the river was increased by the construction of Clough pool and the waterfall (left) which stored up enough water to drive the wheel at maximum power throughout the day. Overnight the reserves in the pool were restored while the mill was idle. See the page on mill ponds. 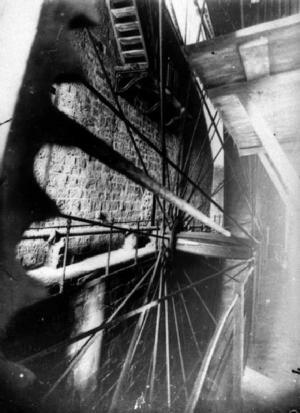 The water wheel (below) directly powered the machinery until 1895 after which the water drove a dynamo and the machinery was powered by electric motors, providing much greater flexibility in the layout and types of machinery that could be used. This was one of the very first mills in the country to be powered by electricity. Originally there was a smaller wheel house containing two overshot water wheels, one above the other, one of 22ft diameter, the other of 32ft, designed to use the water twice. When more power was required the wheel house was enlarged to what we see today and a single 56 foot diameter by 9 foot wide wheel (right) was installed. The wheel at Ingersley mill is famous for the fact that it was, at 56 feet in diameter, the largest in England, and only exceeded in Britain by the wheel at Laxey in the Isle of Man. This was undoubtedly one of the most powerful water wheels installed anywhere. The power of the water was taken through the rim of the wheel enabling the light weight bicycle wheel type structure visible in the picture. Regrettably, some decades after it became redundant, the wheel was removed and scrapped by W.& A.E.Sherratt, dyers and printers. The leat supplying water from the pool to the wheel is still in place and contains a 2ft 6inch diameter cast iron pipe to carry the water along the hillside. The aqueduct which took the water across the road to the wheel house is still in place. This is a rare and important feature of this historic site. Graham Plant, who lives in Kerridge, remembers that his uncle worked at the mill in the early 20th century. The mill was running what were known as ‘beetles’. These were tilt hammers that pounded the cloth in a row of containers which also contained a liquid and the process was designed to put a sheen on the cloth. Graham recalls that in his young days Rainow mill (the ‘modern’ building adjacent to Mill Lane cottages) was a cloth store and this was connected to Ingersley mill by a continuous overhead wire on pulleys and used to convey the rolls of cloth from the store to the mill. First record of a cotton spinning mill on the site is for 1792 when there was a water powered mill with a small reservoir. The reservoir was enlarged, creating Clough Pool and a new leat constructed by 1803 by Edward Collier and this powered two water wheels, one placed above the other (description above). There was also reference to an 18hp steam engine although it is uncertain as to whether this powered the mill machinery directly or was used to replenish the reservoir at times of low water supply. The spinning mill block, upstream of the original mill, was probably built at this time. The mill was bought by Thomas Gaskell, farmer of adjacent Ingersley House (as it was then), in 1811, after Collier became bankrupt, and was damaged by fire in 1819. The buildings on the site at this time included the manager’s house, a warehouse, a smithy and a pauper apprentices house. 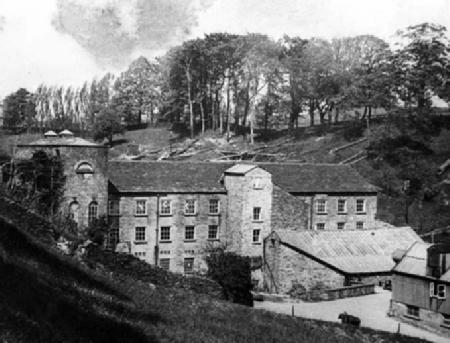 The mill had been rebuilt by August 1821 and the owner, Thomas Gaskell, formed a partnership with Martin Swindells I. By 1826, 330 power looms had been installed. The Swindells took full control of the site in 1830 until 1842 when James Leigh took occupation. During this period, cotton spinning ceased on the site and the buildings were converted to printing calico. It was at this time that the wheelhouse was rebuilt and the single 56 foot diameter wheel was installed, reputed to be the second largest in Britain. By 1874, the mill had changed over to a dyeworks. The mill was acquired by A. J. King (right) in 1878 and the buildings converted to a bleachworks. The first floor of the spinning mill was removed to create sufficient headroom for the bleaching processes and a range of new buildings replaced the older structures on the site. There was considerable expansion of the facilities and in 1895, the water supply was converted to drive a dynamo, rather than the wheel, and all the processes were powered by electric motors. Joseph Stewart and some of his children worked here. The site was sold to Slater, Harrison & Co. and used initially as a printworks for litho and letterpress printing. In 1937, the site was taken over by a number of companies with varied but textile related manufacturing processes. 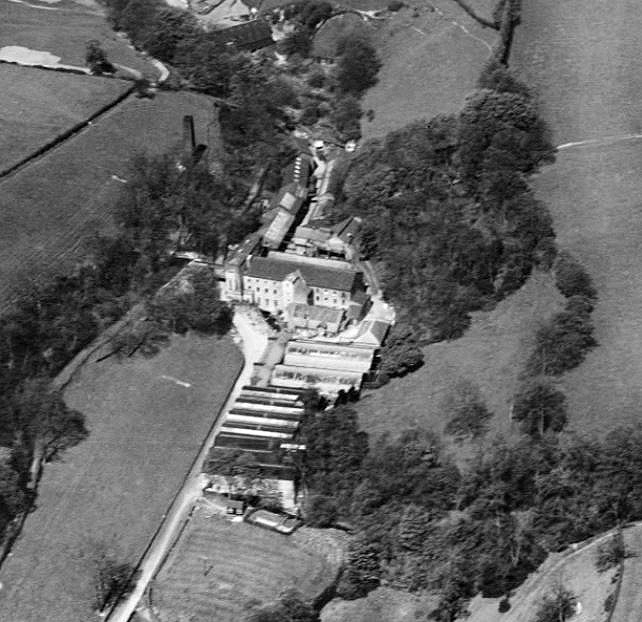 More recent history has been chequered with a succession of companies in the cloth industry including dyers and bleachers renting Ingersley mill. A fire in November 1999 destroyed the roof and floors of the original mill building. The last occupants of the site moved out a few years later and the whole site had descended into dereliction. Planning permission was obtained to redevelop the entire site with new structures on either side of the original mill and the latter developed into 24 appartments. There is lapsed approval for 66 units in total. Site A, the open ground between Rainow mill and Ingersley mill, was once a mill pond providing water to Rainow mill’s water wheel. 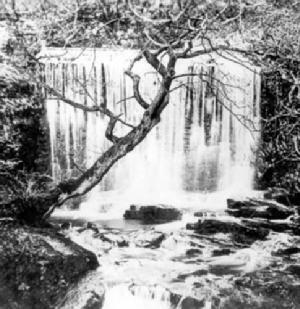 The pond was filled in decades ago, the only relic being the waterfall behind the Rainow mill. Redevelopment of the site began at the end of September 2010 and all the 20thC buildings were cleared. The only part left standing are the walls of the original 1809 mill and the big wheel house. The development plans included the use of water to generate electricity. However, there are a couple of changes that will have reduced the power of the river since the 19th century – firstly the construction of Lamaload reservoir which is used to store water from the river and use it for our public water supply, and, secondly, the silting up of Clough pool so that it is in effect just a river running through to the waterfall. Clough pool has been sold off in the early 2010s to a local private owner who is developing it as a wild life reserve. The development plans for the mill site were on hold after 2012 due to the national financial problems and was sold to HM Government’s Homes and Communities Agency. They were supposed to be getting housing built on sites such as this but little happened other than the erection of a heavy duty, and very permanent looking, steel fence around the site. In January 2015 HCA installed scaffolding under the aqueduct to protect it from any possibility of collapsing into the road. It took until late 2018 before HCA finally sold the site to a developer. We await (early 2019) further information on what is planned for the site. 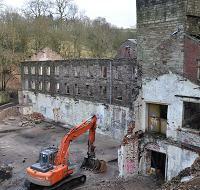 Clough mill was the first to be taken in Bollington by the Swindells family. Martin Swindells I was in partnership with Thomas Fearnley of Stockport. “The two partners would appear to have heard something of a cotton mill in a village called Bollington. They drove into the village by way of ‘Long Lane‘, ‘Cat-ladder‘ & ‘Beeston‘ to see the Clough mill. They took the mill and Martin and his wife Hannah came and lived at the Clough in a pleasant house, the garden of which was hedged off from the road by a broad stream of swiftly flowing water, and a low stone wall.“ More on the Swindells family can be seen on their own page. Letter from A. J. 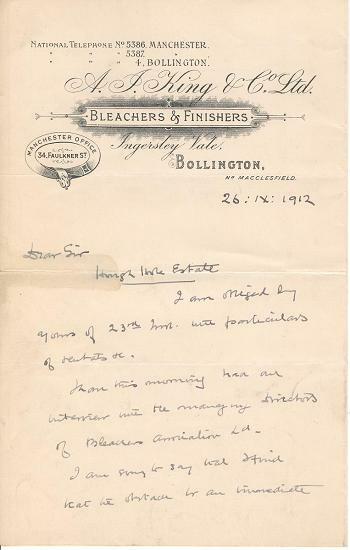 King & Co. Ltd. dated 26:IX:1912 probably to Miss Mellor’s solicitor or land agent concerning King’s possible purchase of land and buildings from the Mellor estate at Rainow. I am obliged by yours of 23rd Inst. with particulars of rentals &c.
I have this morning had an interview with the managing directors of Bleachers x———x Ld. In view of the Rentals & the inaccessible position of the property by road they think this is a liberal offer. x—-x of x–x & you will x—–x your clients in this matter & let me know. 1 Annie Williams and the Wellbrook Beetling Mill, Cookstown, Co Tyrone NI. 2 Ingersley Vale LLP, document describing planned development, 2007. 3 Emma F. Brooke, from notes taken in 1885.